I take a lot of photos while trekking, and most of the time I'm also carrying a GPS with me. As my camera don't have a built-in GPS, my photos are not geotagged while shooting. Luckily, this is an easy task if you've kept your GPS logs from the trip. I'm still very happy with my Garmin GPSmap 60CSx that I bought 7 years ago. By changing the setup, the GPS allows me to automatically save the tracks to the memory card. I get one GPX file for each day trekking named with the date. I can easily transfer these tracks to my computer or smartphone with a cable or a card reader. You have a lot of options, so make sure to read the "Geotagging with ExifTool" documentation. ExifTool is modifying the Exif headers of your image files, storing the location data in the same file. To see the result on a map, I'm using Picasa. Click the map pin button (bottom right) to see the map. If the positions are not shown on the map, try to right-click the image folder and select "Refresh Thumbnails". 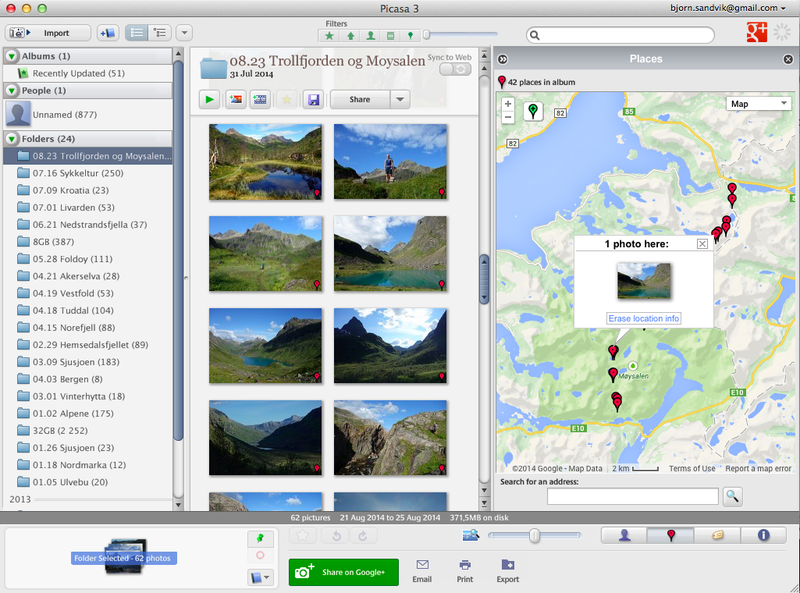 If you don't have a GPS track you can always use Picasa to manually geotag your photos. Be aware! I just learnt that social media sites like Facebook, Twitter and Instagram removes the Exif data from your images. Google+ don't. Now, how can you display the photos on your own map? It will be the topic of my next blog post. I use my tracks on mac, as i also miss geosetter. exiftool i did not try yet but i will do. What about pic services like flickr or 500px ? Do they also remove geotags? There is need to install homebrew to get ExifTool. A Mac DMG installer is available from the ExifTool home page. Plus, this version is likely to be more up-to-date than the version you get via homebrew. However Picassa will be gone in April. Can I use this plugin for its successor "Google Photos". And I'd like to use photo image files stored in local storages. Can I add some function to load these ones to this plugin by use using HTML5's photo api? Thanks for your post. Some helpful stuff here. I am new to this whole geotagging thing, but it is an awesome idea. I really like the idea of being able to share my adventures in more detail. Of course like all good things there are cons as well, but with a little common sense there isn't much we need to worry about. I have heard a lot about ExifTool, it is something I am going to look into. I have been scouring around for some good tools and what not for geotagging, so i really appreciate your advice. It has a lot of good ideas for equipment, pros and cons, and other general info for newbie geotaggers like me.